The Office of Social Equity & Inclusion and the Painting department invite you to join us for an artist talk and conversation with Alaska-based artist Sonya Kelliher-Combs as part of our ongoing Indigenous Arts Series. Kelliher-Combs’ artwork references place, history, culture and family. 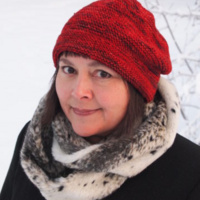 She is the recipient of numerous awards including the Eiteljorg Museum Fellowship, the Anchorage, AL Mayor’s Individual Artist Award, the Arctic Education Foundation Academic Excellence Award and the Best of Show honor at the Visual Arts Center of Alaska’s Vision of New Eyes exhibition. Her work can be found in numerous private and public collections, including the National Museum of the American Indian, Anchorage Museum, Eiteljorg Museum, British Royal Museum, Institute of American Indian Art Museum of Contemporary Native Art and Alaska State Museum.